When you accidentally delete a photo - or a whole holiday's worth of photos - it can be upsetting. But these lost images can quickly be recovered from your camera's card with Klix. Klix takes the power of its big brother, Data Rescue, and puts it in an easy-to-use package that's designed specifically for photo recovery. Provided your camera, or card with a reader, shows as a drive on your Desktop, Klix can read it and restore your last roll of deleted images. So if you can connect your camera with iPhoto, it'll work. Klix recovers both images and movies. The process of recovery is surprisingly simple. There are no crazy settings you have to adjust or secret codes you need to know. Just connect your camera to your Mac and fire up Klix. Your photo card will most likely be showing on the device list, whether it's in a camera or reader. Press the Start button and Klix scans the card. When the scanning is done, you can highlight all the thumbnails Klix shows with a button press. This makes it easy to save all the images that can be recovered. If you just want one image, double-click on the thumbnail and Klix will open it in the photo app you have assigned to that file type - usually Preview or iPhoto. There are not a lot of consumer programs that can recover images yet, but of them Klix is the easiest to use. It will quickly become your security blanket in knowing that lost images can be found. Since Klix is so simple in operation, there are few things that can go wrong. Sometimes if you plug in a device while Klix is already running it won't see the drive. From the File menu you just choose Look For Media Cards and Cameras and it will appear on the list. As Klix is a recovery program, it has to scan every byte of the card. The process can be complicated by a slow connection on the camera or reader, card speed and size, port speed and processor speed; recovery could take a few minutes or an hour, depending on these factors. 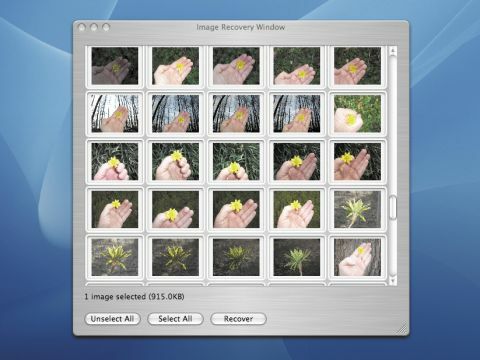 Although Klix is predominantly for photo recovery, it has a few extra features. One is backing up. Klix enables you to make a disk image of the raw data on a card for recovery by Klix later. This way you can archive the lost data from multiple cards without having to deal with it immediately. Klix can then recover this archive if needed. There's also a speed advantage in backing up. It only took two minutes to dump a 2GB card and three minutes to restore the data from the disk image. Another nice feature is the ability to truly erase the media card. Images are not really erased from cards when you delete them. That's why Klix can get them back. When Klix erases a card it resets all data for every byte. This gives you the security that if you sell a card, deleted images can't be recovered. There are three levels of erasure to choose from Preferences: Level One is fast and adequate for most, Level Three will bring comfort to the paranoid. There are other pieces of software out there that do what Klix does. At £20, it's not the cheapest, but it is the easiest and fastest of its type. You can also download Klix for £19 from www.allmacshop.co.uk/joesoft.